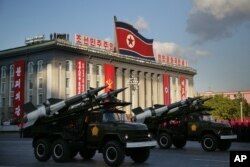 North Korea is believed to have a fleet of military drones. And now, South Korean researchers are testing unmanned aerial vehicles, or UAVs, to take on that threat. The South Korea unmanned craft is no ordinary drone. It is designed to detect and attack an enemy UAV in mid-air. Shim Hyun-chul, head of the unmanned systems research group at the science and technology graduate school KAIST, and his team of students recently tested the new technology. He said drones can be made by anyone these days. “The fear is that the drones are very easy to build… They can do a lot of things. It appears as a very new threat,” said Shim. And in South Korea, that threat comes from the North. North Korean soldiers parade through Kim Il Sung Square with their missiles and rockets during a mass military parade, Oct. 10, 2015, in Pyongyang, North Korea. North Korea’s military power was on display at a recent celebration in the capital, Pyongyang. That included what appears to be a fleet of drones, some of which might already have crossed the border. South Korea’s defense ministry says that since 2014, it has recovered four crashed North Korean drones. One of these small UAVs reportedly flew a reconnaissance mission over downtown Seoul. A drone is paraded in Pyongyang, North Korea, Oct. 10, 2015. While these appear to have only taken pictures, some security analysts worry that weaponized drones could come next. Moon Sung-muk with the Korea Research Institute for Strategy in Seoul called for a new plan to face the new threat. “We did not expect that North Korea could make such small drones and avoid our radar. 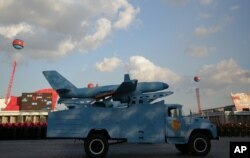 South Korea must come up with a new security plan to detect these drones quicker and attack them,” he said. And that could start with the attack drones that Shim Hyun-chul and his team are working on. Shim said confronting North Korea’s or any enemy’s UAVs will not be easy. “Drones are very small, drones are very hard to detect, even if you detect it there are very few things that can be done,” he said. Shim said all his team can do is perfect its drone technology faster than the enemy perfects theirs.